Yesterday was the big hair cutting day at Amy of Denmark. First I was surprised by my mom, Heather and James. James came in the door with balloons for me saying SURPRISE! What a sweet sight. When we got to Amy’s I was pretty nervous. I know, it’s just hair, but its something about letting it go of it that gets me. I think it’s like cancer trying to take away your femininity. Which brings me to the reason we all went back to the wig shop in the first place. 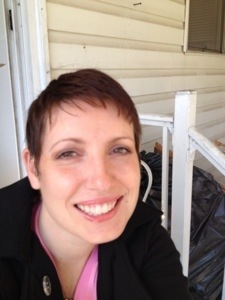 I was not letting cancer dictate when I was going to loose my hair. I was telling cancer whose the boss here. ME! The girls brought wine and champagne to take the edge off and it was time to begin. Once Tina started cutting I was actually ok. I mean I’ve had short hair before so its not that crazy. Just different. So once all the pieces were cut, Tina brought over a wig to show me how they would fit and feel. 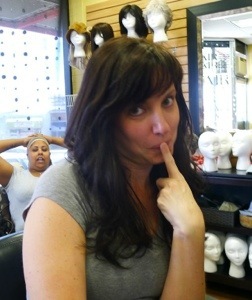 I thought she was placing in one of my wigs since I knew they needed to be adjusted. But to my surprise it was the real hair wig I had tried on during our first trip that I fell in love with! At the exact same time my lovely friend Sarah Nees handed me an envelope. In it was a card that stated “it’s not the size of the girl in the fight, but the size of the fight in the girl……and the size of the group of people who love her. Your dream wig is yours, from all of us!” OMG are you serious??!! My heart just exploded as the tears overflowed. I mean, this wig cost $$$$$$ And all these people, some of whom I’ve never met and don’t even know, did this for me. There are no words to express how incredibly loved I felt at that moment. Not because of the wig or the money that was collected. But to know that I matter to all of theses people. That they all came together out of love for me and a strong dislike for this disease just is amazing. I’m still crying while typing this post! This entry was posted in Breast Cancer, Recovery, Treatment and tagged breast cancer, cancer, Chemotherapy, hair cutting, hair loss due to chemotherapy, Side Effects by surviveber. Bookmark the permalink. You go Amber! I also recently bought a wig in preparation for chemo which, oddly, begins on Halloween. So I guess I’ll be going as myself, cancer girl : ) Keep up the fight and best wishes. I have my second treatment this coming Friday. They say during the week after your second treatment is when it starts to fall out. So I might be going as G.I. Jane! You’ll always be the most beautiful woman I know..inside and out! You look fabulous and always will! Keep up the smile beautiful! Amber, with a smile like that you can rock anything!